This hairy close relative of Betony and Marsh Woundwort, which are also members of the Mint family, spreads not only via its seeds but also by means of slender underground runners, called stolons. Hedge Woundwort is an erect perennial plant that can grow up to a metre in height and forms patches in shady places beside hedges and on woodland edges. As with other members of the Stachys genus, the solid stems of Hedge Woundwort have a square cross section, and they may be either unbranched or very occasionally branched. The stems are more noticeably hairy in the upper region of the plant, and there are nodes widely spaced along the stem. From each node emerges a pair of opposite stalked hairy leaves; these are an elongated heart shape and toothed rather like the leaves of Stinging Nettle. (When it is not in flower, it is all too easy to mistake Hedge Woundwort for a nettle - and vice versa! 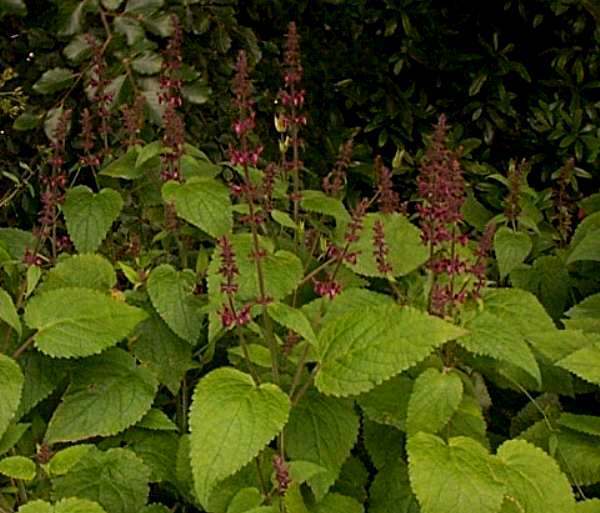 ; however, the leaves of Stachys species do not sting.) There is no rosette of basal leaves. There is an unpleasant smell associated with this plant, and it is particularly strong and pungent if the stems or the leaves are crushed. Insignificant when viewed from a distance, the reddish-purple fused bilabiate flowers of Hedge Woundwort have a convex (hooded) upper lobe, while the tri-lobed lower lip is intricately patterned with white markings. Ranging from 13 to 18mm long, the finely-hairy flowers are borne in whorls around stems, forming inflorescences in interrupted spikes that are very beautiful when studied at close quarters. 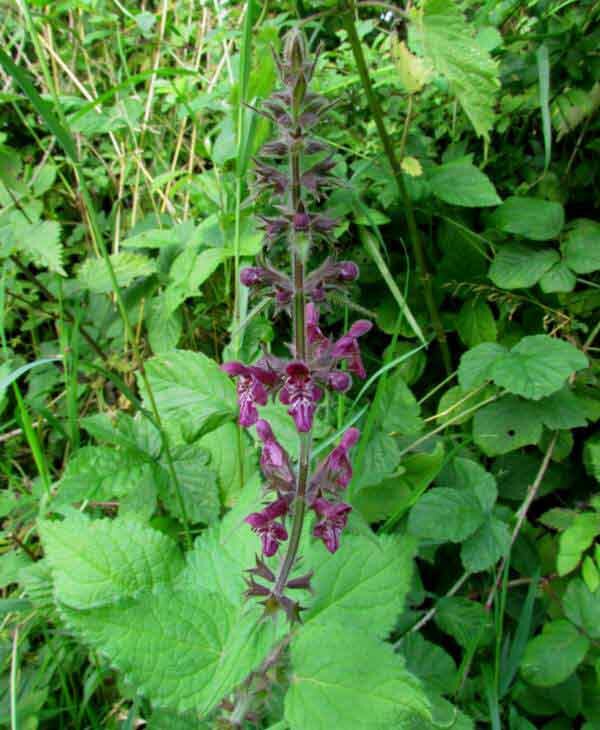 Hedge Woundwort is found throughout Britain and Ireland, where it is a fairly common sight. This wildflower occurs throughout most of Europe except the far north of Scandinavia, and it is also recorded in many parts of Asia. Stachys sylvatica favours the edges of deciduous woodlands and hedgerows, but it can also be seen on waste ground and occasionally beside rivers and lakes (where Marsh Woundwort also occurs). In Britain and Ireland the main blooming period of Hedge Woundwort is July and August, but it is usually possible to find a few early flowers in June and stragglers as late as the end of September or some years even into mid October. This plant has a long history of use in herbalism, and as the common name implies it was regarded as very good for dressing cuts and other wounds. Woundwort is reputed to cure aching joints when made into an ointment and to have antispasmodic and sedative properties when taken internally. Honeybees and bumblebees also like to visit the flowers of both Hedge Woundwort and Marsh Woundwort; this, when the two species are growing in close proximity, can as a result of cross pollination and so produce woundwort hybrids. Stachys, the genus name, means 'spike of flowers', and plants in this genus do indeed produce flowers in spike form. The specific epithet sylvatica means 'of the forest', and for the most part Hedge Woundwort is a plant of forests, or at least of forestsides and forest rides and the edges of woodland clearings. 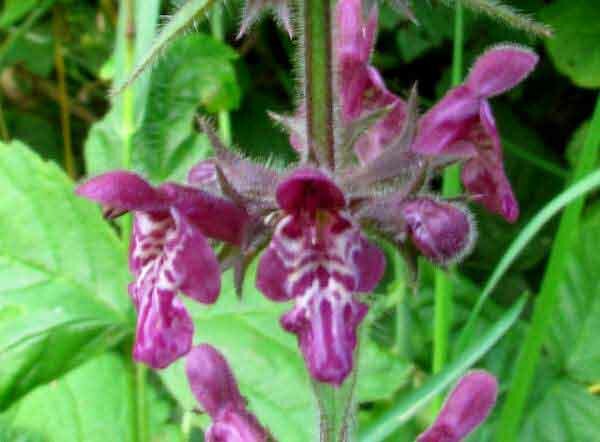 Other common names for Hedge Woundwort include Red Archangel, Common Hedge Nettle, and Grass Nettle. Marsh Woundwort is similar in stature and form but has paler flowers and unstalked leaves; the leaves of Hedge Woundwort are stalked. The Hedge Woundwort plants shown on this page were photographed in Cambridgeshire, England, and in West Wales.